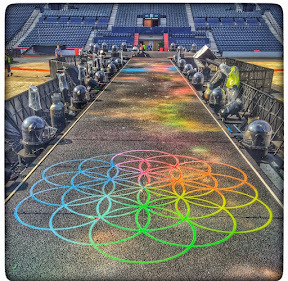 Maria Callas kicked off Coldplay's biggest gig in Scotland yet and we knew were in for a night of classics. 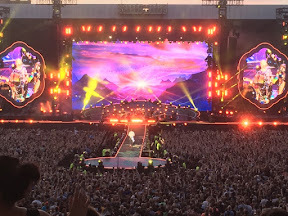 For a band that is often misrepresented as being boring and bland, Chris showed his sold out crowd at Glasgow's Hampden Stadium that he has more charisma in his little pinkie than his detractors. A Head Full of Dreams, the title track of the tour came before anthemic Yellow which got the crowd singing along. Every Teardrop Is A Waterfall gave them more of the same and Paradise proved to be a full on party track which even had Chris dancing along the runway. 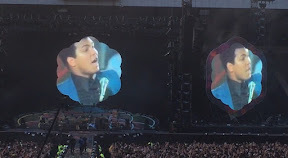 A touching tribute to Muhammud Ali came with a moving video of the Greatest man himself and later in the set Chris paid tribute to David Bowie with his own rendition of Heroes. The crowd was warmed up and then we all exploded with joy along with the confetti cannons as we went into true party mode on the A stage with a run of the biggies Clocks, Hymn For The Weekend, Viva La Vida and Adventure For A Lifetime. Giant bouncing balls were thrown about the stadium as everyone jumped up and down with glee like excited teenagers at their first school dance. 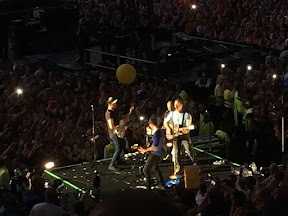 And then Chris and co disappeared off the stage only to reappear on an even smaller stage towards the back of the stadium giving seated guests an even better view. He sang Amazing Grace before giving one lucky Scots fan a song she requested on Instagram. 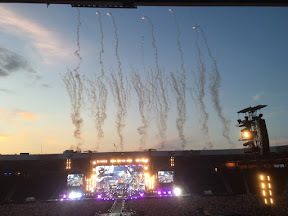 The canons boomed, the confetti fell, the pyros blazed, the lasers blasted and Hampden was filled with love. A sea of neon armbands waved for Up and Up, bathing the stadium in a rainbow and it was the perfect end to a brilliant day. 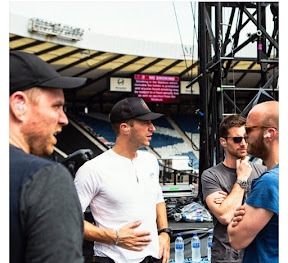 COLDPLAY arrived by private jet in Scotland at lunchtime before their Hampden gig this evening. 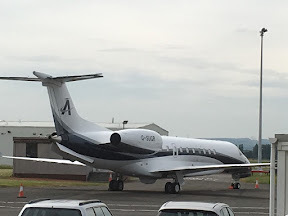 Chris Martin and the lads were on top form as they stepped off their private black and white Embraer Legacy plane and were met by a fleet of people carriers at Glasgow Airport. They came direct from London and are scheduled to fly straight out this evening. 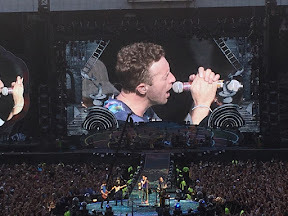 Last time they played here however, Chris Martin stayed on to party and took a civilian flight back home the next day. A member of their entourage took a picture of their tour buses outside the venue earlier this morning to tease fans that they'd stayed overnight. The lads could be heard sound checking at Scotland's National Stadium just after 2pm and they even posed in front of the saltire to prove they were in town. Here's the set list from Manchester a few days ago. HAVE you seen a ghost at Silverburn? Shoppers at the Scots shopping centre in Glasgow have been left terrified, after spotting a ghostly figure floating through the nine-year-old Pollok building. The apparition, said to be of a woman dressed in all black period clothing, has left Silverburn staff baffled, as it is the fourth sighting to be reported in as many weeks. Silverburn Management have since taken the unusual step of calling in paranormal experts, Glasgow Paranormal Investigations, to help establish the cause of the sightings. A spokesperson from Silverburn commented: "We are aware that a shadowy woman has been spotted around the centre and we are taking the sightings extremely seriously. We have reached out to local experts in the field of paranormal activity, who will hopefully be able to shed some light on the matter." One shopper who wishes to remain anonymous commented, "We were waiting on our friend coming out of one of the shops, when out of the corner of my eye I saw this dark figure down the corridor, almost hovering – it was terrifying." Silverburn security guard Thomas Chalmers, who also claims to have seen the ghost said: "I had just finished my shift and was leaving the centre bathroom, when I just felt this sudden chill. I didn't think much of it, but as I looked up I saw this shadowy figure disappear down the hall. There is no way that it was human." A member of Glasgow Paranormal Investigations explained: "It is not uncommon for a spirit to be attached to a site before the present building was constructed. Possibly Silverburn or the construction of the new cinema disturbed it. This can be common in hauntings. The most important thing is to ensure whoever it is, finds a peaceful resting place." Silverburn opened in 2007, built on the former Pollock shopping centre site. Last year the centre opened a further £20million extension to the building, comprising of a Cineworld cinema and a new restaurant wing. Prior to the recent sightings there have been no official reports of paranormal activity.